See the Atlas map in full, and find out how it works while you wait for the game to release. 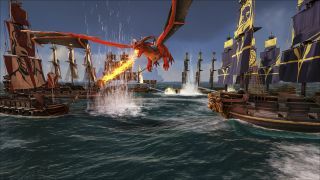 As the launch of Atlas, Grapeshot Games/Studio Wildcard’s piratical MMO game is pushed back again, it felt like a good opportunity to answer questions that interested players have sent about the Atlas map which you can find in our magazine cover feature. It was provided by Wildcard and was an accurate representation of the game world at the time the feature was written, so the very end of November. The map above is the one I saw several times in-game as we navigated. I think some people have been querying the lack of massive continent-sized land masses. We didn’t discuss that directly with the studio, but the reason it didn’t come up was because the game felt so focused around life as a sailor/pirate/trader. Larger land masses didn’t feel like they would do anything but detract from that by encouraging players to stay on land. It’s not a game about landlubbers, basically, so the ratio of sea to land felt like it made sense. The idea of the world as a globe versus the world as a square map. I did ask about this one as the game’s logo sits right in front of a globe, but globes don’t translate to perfectly square maps without massive distortion. The short answer is that that globe isn’t a representation of the world a player will explore, but the map is. The longer answer is that the map creates a fudged globe by letting you wrap around it as you explore, so if you sail off one edge you appear on the opposite edge. As soon as you start thinking about how that would translate into a 3D shape the globe idea falls apart, because heading north-east will suddenly put you in the south-west. The biomes of the world are currently arranged around the idea of two poles and an equator, as well as an east and west hemisphere, and I'm interested to see whether the developers will stick with this. So if you’re halfway down the map you get those sunny, tropical spaces, and at the top and bottom you get arctic/antarctic spaces. I’m curious to see how those wraparounds work with the biomes, and how they signpost that you’ve suddenly ended up in the south or the east or the west. That’s not the sum total of biomes, by the way—I think there are currently seven or so in the game and the intention is to get to 21 (although I can’t find the audio to double check that number right now). The map above doesn’t have fog of war, so what you actually see in-game will change depending on where you have ships and bases and the like. There’s also the sextant—an item which you can use to increase the area of map you can see around you by lining it up with stars. I can’t remember if we had space for this in the magazine, but Wildcard’s calculations say it should take about 30 hours to go across the map in a straight line. I believe this was going from east to west, so I tapped into my school maths knowledge to figure out that going diagonally should take about 42 hours. A squared plus B squared equals C squared, yo! The grid squares are to help you read the map rather than being things you will encounter in the world. The idea is that the game is performing hand-offs from one piece of hardware to another as you navigate, but you shouldn’t experience that in-game. I only played when the servers were supporting maybe a couple of dozen people, so I can’t speak to how that will hold up when the game goes live. And that concludes today's episode of MAP FACTS! There’s a bunch more information in Steven’s feature online, and I cover slightly different things in my piece in the magazine (including Steven firing on our own fleet by accident).